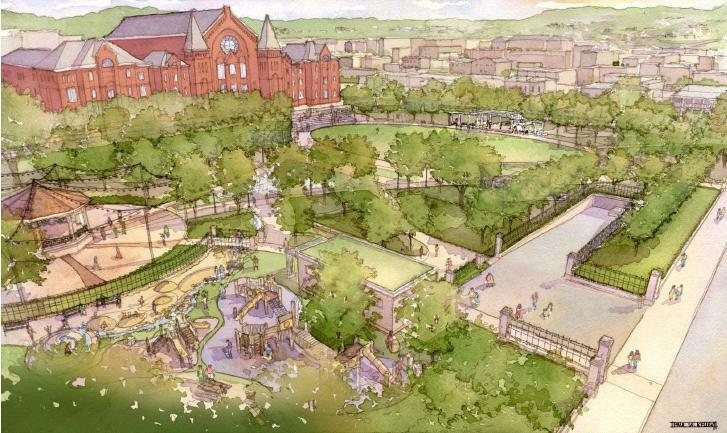 The Cincinnati Center City Development Corporation (3CDC) and the Cincinnati Park Board will be presenting their plans for the $46.2 million redevelopment of Washington Park on Thursday, May 20 at 6:30pm. The presentation will be made at the Art Academy of Cincinnati just blocks away from the historic park in Over-the-Rhine. Earlier this month 3CDC released new information on the redevelopment project including new renderings, financing plan and a general time frame for completion. Once complete, the renovated Washington Park will include a 500-space underground parking garage beneath a two-acre expansion of the park north to 14th Street. Other changes include the incorporation of a dog park, upgraded performance facilities, a splash ground to replace the existing pool, and other facility additions. Some neighborhood residents have expressed concerns over the design of the new facilities in terms of how they relate to the existing urban fabric of one of America’s largest, and most significant historic districts. Since 2006, there have been six Steering Committee meetings and five general public meetings on this project. Over that time, there has also been a number of organizational meetings including the Cincinnati Recreation Commission, Cincinnati Park Board, Over-the-Rhine Community Council and the Historic Conservation Board. Officials working on the project hope to finalize financing and design plans soon so that construction work can begin this summer, with an expected completion in fall 2011. The Art Academy is located on Jackson Street (map) near the Know Theatre. Free bicycle parking is available in the immediate vicinity, on- and off-street automobile parking is available for free and for payment, and the Art Academy can be reached by Metro bus service (plan your trip).